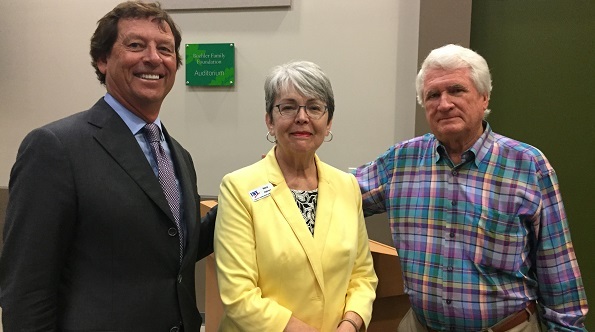 The Collier County League of Women Voters held a solar forum earlier this month. Almost 100 turned out to the Naples Botanical Gardens to learn from others’ varied solar experiences. Neville Williams, a longtime, international solar developer and author of “Sunpower” and other books, moderated the panel. Jim Henderson, a Naples area businessman who owns Collier County’s largest commercial solar array, shared his experience about “going solar” on his warehouse used for his moving and storage company. Mary Dipboye described how FL SUN was bringing solar co-ops to communities around the state and how they benefit homeowners by make “going solar” easier and more affordable. Chad Washburn, Deputy Director of the Naples Botanical Garden — he shared how his father had built a passive solar system for his childhood home. He also discussed the Naples Botanical Garden use of solar. It installed solar PV panels to help supply the electrical needs of the Garden’s laboratories. If you are interested in holding a similar discussion in your community, reach out to Mary Dipboye, FL SUN Advisory Committee member at mdipboye@yahoo.com.